Fáilte Isteach began a decade ago with a handful of students and volunteer tutors. It now has 110 branches, with 3,200 students from over 50 countries receiving 72,000 hours of tuition during the academic year. This dramatic expansion illustrates the need in today’s Ireland and the organisation today finds itself working with a growing number of refugees. Fáilte Isteach is a community project welcoming migrants through conversational English classes. The project provides the necessary language skills in a student-centred and inclusive manner, while involving older volunteers as tutors, and recognising their skills, expertise and contribution to the community. The work of Fáilte Isteach is featured prominently in a national report launched recently in Dublin by David Stanton TD, Minister of State for Equality, Immigration and Integration. The Report on Language and Migration in Ireland is the result of collaborative research between NUI Galway and the Immigrant Council of Ireland funded by the Irish Research Council. The report looked at the linguistic challenges that migrants face daily and the centrality of language to an individual’s identity. “The work of Fáilte Isteach represented one of the few opportunities for migrants to have real interaction with Irish people and Irish accents,” said Dr Anne O’Connor, NUIG, report author. Fáilte Isteach is a national programme of Third Age, a not-for-profit organisation committed to social inclusion in 21st-century Ireland. All Third Age programmes provide a bridge of friendship, connection and contact for people, who may be isolated by age, language, technology or frailty. The programme is funded by the Department of Justice and Equality and the Iris O’Brien Foundation. “We are different in that we combine education with integration,” explains Liam Carey, Programme Manager with Fáilte Isteach. 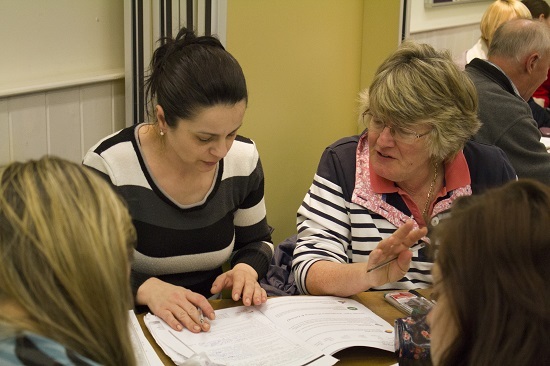 “Our Irish volunteer tutors are drawn from the local community. Interested in setting up a Fáilte Isteach Group? Advertise for students and begin classes. To find out more about Fáilte Isteach contact Third Age at 046 955 7766.